Exclusive: MI6 caught up with Young James Bond author Charlie Higson to talk about his third Young Bond novel ahead of its official unveiling in London on January 3rd 2007. 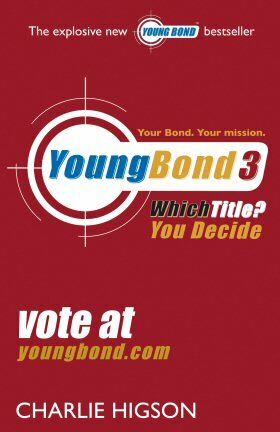 Speaking for the first time to a 007 website about the new book, Charlie Higson talks about the titles and elements of Young Bond 3 in the part one of this serialized MI6 interview. How much choice and input did you have on the three titles that were selected for the public vote (Double Or Die, The Deadlock Cipher, N.E.M.E.S.I.S.)? Well they were all titles which I liked, and between us and the people at IFP we all had some input into them. On previous books we had battled through right to the end and made a choice we are all happy with. On this one we got to a certain point and said why don’t we leave the final stage to the kids who read the books, and let them chose the title that they think they would like to see? It was something fun and a good way of involving the kids in the process of the book. I’ll be happy with which ever of those three titles is chosen because I like them all and they all work in different ways and have a different feel about them. It will be interesting to see which one has been chosen. Above: Temporary UK artwork used before the title is unveiled on January 3rd 2007 in London. What were the working titles of Book 3 before the vote? Well we had loads and we banded them around at one time or another, I had another short list of titles before this list. One of them was “The Big Smoke”, “Six Days In December”, and “Shoot The Moon” was a vague working title on it. But none of these titles would have been right for it. This is the longest Young Bond book by a narrow margin, yet it is set over a shorter time period. Is this due to it being a more complex story? If you look into it the books are all about the same length, I think they are all in the region of 80,000 words. It’s written in the same style as the other two, whether a story takes place over three days or over three years it does not necessary dictate the length of the book. You could have as much incident happening over three days as over three months. I like the idea of a condensed timeframe and it’s something Fleming did in Moonraker, there was a fairly condensed time frame in that. In the writing of my books there are echoes of what Fleming was doing. My five books are going to very roughly echo the style, themes, and content of his first five books. There are some returning characters in YB3. Who did you choose to bring back and why? I had always intended for Bond to meet up with Red Kelly again, even when I was writing SilverFin as I had a scheme for the other books. I wanted to do a sequence where Bond ends up in the East End of London and has to meet up with Kelly again. There will be other characters coming back and interweaving the different stories together in the other books, and leading into the book five. Of the three books you’ve written so far which has been you favourite book to work on and which do you consider to be your best piece of work? That’s a bit like asking somebody who their favourite child is. They’ve all been fun to work on and fun in a different way. SilverFin was great because it was first one I could do all the classic Bond elements and have a lot of fun with it. 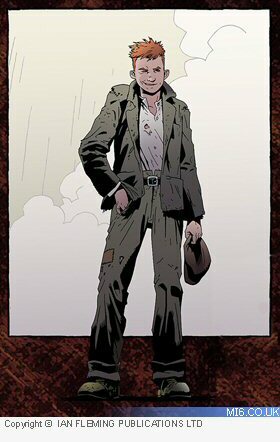 Above: Red Kelly will meet up with Young Bond again in the third adventure, which is set in the East End of London. Blood Fever was fun writing about the Mediterranean which I love and taking Bond off to Sardinia and going to Sardinia myself; seeing all the locations was great. And book three is about working out the clues. They have all had something different about them that have made them fun in their own way. I think of them as once piece rather then separating them out individually. I’ve written the fourth one now, they all become one thing. So I don’t have any favourites. Stay tuned to MI6 for the next installment. Many thanks to Charlie Higson.